Surface area covered in alternating channels of amethyst and tourmaline crystals - includes single control panel with variable heat settings and timer. Experience the therapeutic benefits of far infrared light and negative ions to assist our human system in the creation of effective detoxification and elimination of acidic waste and contribute to an alkaline condition in the body. Mini BioMat: amethyst: 2.64 lbs & tourmaline: 2.64 lbs. Amethyst Pillow: amethyst: 1.54 lbs & tourmaline: .88 lbs. U.S. F.D.A. Licensed Medical Device (#K072534, 2954299) and it has been given FDA status of a "Class 2"--important benefit, Medical Doctors have written prescriptions for this product for symptoms including arthritis, circulation problems, depression, neuropathy, pain, insomnia, fibromyalgia, lyme disease, paralysis and more. Simultaneously keeps head cool allowing the body to receive higher temperatures - an important Ayurvedic health concept. Essential for quantum healing, the Amethyst Pillow features a therapeutic shape to provide important neck stabilization. Channels of amethyst and tourmaline crystals carry BioMat energetics deep into cerebral spinal column and brain stem. The massage table has two Mini BioMats end-to-end to allow for greater comfort with a full length total body experience. Given the two mats, there are two control panels. Differing temperatures may be set if desired. 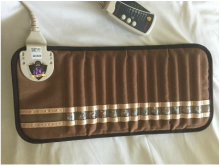 Also in the treatment room on a comfy futon are the Professional Amethyst BioMat, Amethyst Pillow, and BioBelt. These are in the Studio for independent use, or during a table treatment. The futon and the massage table provide for two people during the same session. The BioBelt has 8 types of semi precious crystal gemstones: Amethyst, Green Jade, Black Tourmaline, Topaz, Tiger Eye, Citrine, Elvan and Quartz. The warmth directly speeds up digestive enzymes, which produces a cascade of other effects. Digestion and metabolism are improved, and serotonin levels increase, leading to satiety and reduction of appetite. 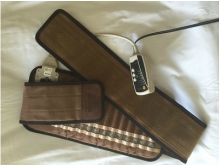 The BioBelt's smaller size and velcro belt allow it to be the most versatile BioMat product. It can be used on many parts of the body that are harder to reach with the larger mats. It works in combination with those mats. The active crystal portion is 8″x18″x1″.